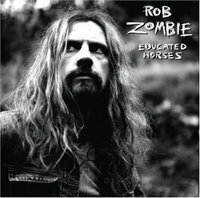 I'm very happy to have had a chance to hear the new Rob Zombie CD (early no less). For Zombie fans it is very worth owning although it took me a couple of listens to truly appreciate the direction he's gone in. Rob is joined by John Five (guitar), Blasko (bass), and Tommy Clufetos (drums). This is a stripped down Zombie - which is what caught me off guard. He has ditched the cacophony of techno-tinged sample heavy grooves for a more 70's stoner vibe (you can definitely hear the Black Sabbath and Alice Cooper influence on this disc). This is a new direction for Rob and I applaud him and the crew for moving into the next phase of his music career. "Educated Horses" was produced by Zombie and long time producer Scott Humphrey (Metallica, Motley Crue), who together also produced the platinum hits Hellbilly Deluxe and The Sinister Urge. Other musicians contributing to the CD are Josh Freese (A Perfect Circle, Vandals) and Tommy Lee. Zombie, a prolific video director in his own right having directed over twenty five videos, will direct the video for "Foxy Foxy" (the first single) Zombie will re-team with The Devil’s Rejects cinematographer Phil Parmet. Parmet has also worked on Led Zeppelin’s "The Song Remains The Same" and Frank Zappa’s "Baby Snakes".